Shira Sebban was very close to her mother, Dr Naomi Moldofsky…writes Sharon Berger. Upon her death she discovered an unknown diary which gave her a glimpse of her mother’s experiences in Israel in the mid-1950s. Not only was she able to discover a side of her mother she never knew, but the diary describes a very different Israel from today. 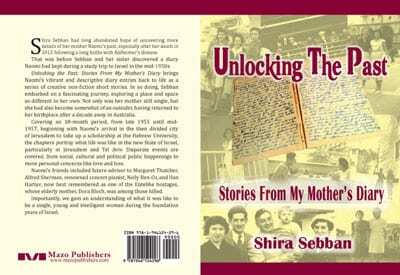 This discovery encouraged her to further explore this early period in Israel, and resulted in her first creative non-fiction work Unlocking the Past: Stories From My Mother’s Dairy.Using the diaries as the scaffolding Sebban had done extensive research to fill out the stories in an interesting combination of historical insight, politics, social parties, and an array of potential suitors. This intriguing mix of the mundane and historic tells this period of Naomi’s life in a series of short and easy to read vignettes. Chapter by chapter we get to know Naomi’s unsentimental character better. She is a no nonsense conservative young lady, focused on her economic studies, for which she won a scholarship to study at Hebrew University. Her parents bemoan her spinsterhood in her late 20s and Naomi grapples cynically with her ongoing loneliness. After 10 years in Australia Naomi had become “too Australian” and “not much of a sabra anymore. We meet her friends, her professors, and her family and get to know her better as a music aficionado and book lover. At times it is a bit tricky to keep track of the cast of changing characters surrounding her and once or twice the reader is introduced to a character and then left hanging as to what happens with them. However this is the limitation of writing creative nonfiction, one of the fastest growing literary genres. Most poignant are Sebban’s descriptions of Israel, in its nascent statehood, which transport the reader to a totally different world from today’s start-up nation. Descriptions of armoured plated vehicle convoys to the Hebrew University Mt Scopus campus, the elegant Edison cinema, Jerusalem neighbourhoods newly built on the ruins of Arab villages, and a no mans land occasionally interrupted by sniper fire dividing the Israeli controlled West Jerusalem from the Jordanian controlled East Jerusalem were all very real during Naomi’s stay. She also refers to fascinating interactions she had with newly arrived immigrants from Yemen and Egypt. Sebban’s skill is in recreating these scenes in vivid detail for the reader, almost making one feel like they have been taken back in time. While her detailed descriptions are recognisable to anyone who has spent time in Israel the passage of only 60 years has totally transformed these depicted landscapes. The archival photos interspersed throughout the book further help bring both the characters and locations to life. The book highlights how much has changed in such a relatively short time. Naomi describes a time when people did not have telephones in their homes and communicating plans was challenging. Yet today Israelis have one of the highest rates of mobile phone usage in the world. Interestingly some things have changed very little even with the passage of time: ultra-Orthodox rioting against the use of public transportation, Jerusalem’s sleepy nightlife, Steimatzky’s book stores, impatient Israeli crowds, terror attacks, and Independence day military parades, to name a few. It is difficult to be impartial when writing about someone so close to you but Sebban has done an excellent job of being honest with the subject showing not only her achievements but also her shortcomings and frustrations. In doing so she has made Naomi’s story come to life in an enchanting way. This question and answer routine would be repeated each morning like a familiar ritual when we would ring to check on the “Old Boy” as he was affectionately known, who still lived alone in a flat nearby. I assume he appreciated our concern, although he never said so. Still we need not have worried … not then. Relishing the solitude that enabled him to read, think and write—so long as it was interspersed with alternate dinners at his son’s and daughter’s homes each evening—he was keen to preserve his autonomy for as long as possible. Until well into his eighties, Saba (Hebrew for grandfather) would continue his exercise and diet regime, doing daily sit-ups and stretches, taking afternoon naps, munching on carrot and celery sticks, and preserving prunes in jars, which took up almost all-available bench space in his kitchen, be it at home in Melbourne, Australia, or wherever he was living overseas. I can still recall our family kitchen in London, filled to overflowing with my grandfather’s preserves, his snores emanating from the tiny bedroom next to the one I shared with my sister. Not to say, however, that he lacked a sweet tooth. He could whip up a mean trifle and revelled in long smorgasbord lunches at fancy hotels, where he would indulge in chocolate éclairs and other treats, acknowledging his diabetes by popping a sweetener into the habitual tea with lemon he drank after every meal. Lemons were so important to him that when he was asked to look after us as teenagers while our parents were overseas, he would dutifully arrive each evening for dinner and promptly disappear outside to water the lemon tree, which he believed would prevent the fruit’s skin from thickening. In the morning, he would depart for the peace and quiet of his apartment again, where he could spend the day in undisturbed contemplation. He was also partial to international melodramas, often joining the family in front of the television after dinner, when he would walk around jangling keys and loose change in his pockets during particularly tense moments. Keen to avoid confrontation whenever possible, he would burst into song—usually the old Russian folk tune Ochi chyomye (“Dark Eyes”)—whenever a family disagreement arose, which did not involve him. Every so often, craving intellectual companionship, Saba would pack a bag, sling it over his shoulder, and head off overseas to Europe, his old home in Israel, or the United States, where cousins, who had survived the horrors of the Holocaust, were scattered. He would visit each in turn, and they would host family dinners in his honor and write him letters in English, Hebrew, Yiddish or Polish when he was back in Melbourne, sharing how they had delighted in his company. During these trips, which could last several months or sometimes even years, he would commune with philosophers and historians at academic institutions in London, Boston, or Tel Aviv or on long walks through the Austrian Alps, even though he himself had not had a formal secular education and, to the envy of his grandchildren, had never even sat an exam. He strove to cultivate a personal relationship with us from a young age too, asking for letters from each of his six grandchildren while he was overseas. If we were remiss in writing, he would remind our parents that we owed him a letter, and he liked nothing better than to respond to our questions, the more philosophical the better. I revelled in his attention—especially on the rare occasions when I was fortunate enough to join him on his travels—and placed him on a pedestal: my wise Saba could do no wrong. I treasure that inheritance today, my study’s shelves arrayed with books my Saba gave me. The one I value most is his personal copy of The Book of Jewish Knowledge, an encyclopaedia of Jewish learning from the 1960s, which he presented to my husband and me during his last visit to our home, scraps of paper still marking the pages most important to him. When bestowing a book as a gift, he would always include an inscription, ranging from a birthday wish or expression of love to an elaborate desire for social cohesion. The dedication on our last gift reads: “Wishing you success and a humane understanding of the kindness and social variety of others. Best wishes from an old octogenarian. Saba.” For he strongly believed that everyday human relations should be conducted with empathy, truth, and love. The patriarch of the family, Saba would preside over gatherings, regaling the table with such passions as the problems of justice and of individual freedom within the rule of law. I recall many festive dinners where the extended family would gather around the long dining room table with my grandfather at the head expounding his views. No two dinners were alike, as he could be relied upon to present his arguments from multiple angles. Alternatively, he might have been keen to discuss what he had read that particular day which, given his eclectic interests, could range from a biography of Galileo Galilei, or the writings of Bertrand Russell, to biblical commentaries on Abraham, Moses, or Samuel, various newspaper articles, which he would mark for others to read, or even an account of the Shakers, a utopian Christian sect, some of whose former American settlements he visited and whose virtual demise fascinated him. Even while on an otherwise disappointing holiday in Tahiti, he derived enjoyment from reading daily doses from a volume of Albert Einstein’s essays, which he had happened to pick up at the Sydney airport. Anyone brave enough to attempt an answer to what Saba meant as a rhetorical question would usually be met with a resounding “no” or, far less frequently, an “oh” in agreement (both words pronounced with a short ‘o’ sound) and a lengthy, passionate exposition of his views. Yet he did not lack for sparring partners. “How do you know that you know?” “What do you mean by God?” Influenced by the late eminent philosopher of science, Sir Karl Popper, whose seminars Saba attended at the London School of Economics in the 1960s and who later became a life-long friend, Saba emphasized the importance of having a skeptical outlook on life and of continuously questioning one’s premises. In contrast to his own childhood experience within an ultra-Orthodox Jewish community in Poland, he argued that parents do not have the right to impose religious beliefs on their children, as such convictions are open to doubt and “It is up to parents to guide the young ones with unquestionable honesty.” At the same time, he believed that an agnostic is still free to maintain traditions as an expression of cultural and communal adherence. He continued to attend synagogue fairly regularly into old age, always ensuring he had a book to read discretely during the rabbi’s sermons. He vigorously opposed the use of force in disciplining children, arguing that physical punishment may “influence the child to look at the world as a society where reason is not a way of life, only force is the language of grownups. The child does not accept the beating as a consequence of being wrong, but rather reflects that grownups beat children because children are weak and cannot fend for themselves.” He was speaking from personal experience, his own father having used force against him. I never recall Saba raising a hand against anyone. For him, the power of persuasion depended on one’s choice of words. Nevertheless, Saba always considered himself an outsider, and although his vocabulary was highly sophisticated, he was particularly unsure of his written English expression, writing drafts of important letters and texts, which were often corrected by his daughter. He advised those around him to do our best to enrich our lives with, what he termed, “mental-spiritual interests.” As he wrote to my teenage sister and me: “Very soon, your holidays start and you have a swimming pool, books, a piano, cello and violin, what a rich life in front of you!” Whenever his children or grandchildren would ask his advice on our future studies, he would steer us in the direction of a great body of thought such as Science or Philosophy and encourage us to be creative and aim for excellence. He set an example by striving to learn mathematics at the University of Illinois in his fifties. My grandfather always remained true to his principles—until, as he put it, he lost his “I”, Alzheimer’s disease ultimately robbing him of whom he was as a person. In my mind’s eye, I can still see him sitting in the middle of his room, endlessly twisting a Rubik’s Cube around in his hands. Up to that time, however, he lived as if he was on an insatiable intellectual quest. As he wrote to me, “Life is full of exciting curiosities, joy, and deep feeling for the world’s mysteries.” Integrity, autonomy, and family were among the values he held dear and are now those I strive to instil in my children. Saba was my mentor and anchor, who showed me that I could do anything to which I set my mind. He encouraged me to stand up for what I believe in and not be afraid to admit I had made a mistake, learn from it, and move on. My children may not have the privilege of growing up in his company, but they can still benefit from the rich and courageous legacy he left behind. Shira Sebban is a writer and editor based in Sydney, Australia, who is passionate about exploring the challenges life throws at us through her writing. A former journalist, Shira previously taught French at the University of Queensland and worked in publishing. She has served on the board of her children’s school for the past 12 years, including three terms as vice-president. Her work has appeared in online and print publications, including Eureka Street, Jewish Literary Journal, The Forward, Australian Jewish News, Alzheimer’s Reading Room, and Online Opinion. She is currently working on a series of creative nonfiction stories based on her mother’s diary, which the family only discovered after her death. You can read more of her work at: shirasebban.wordpress.com. This is a guest post, written by Shira Sebban of Sydney, Australia, who had arranged with my Talmid Muvhak(“Exceptional Student”) Arnie Draiman, to take her and her family to meet the Mitzvah heroes and see the magic that happens when we do. It is no ordinary building. Not for its residents, nor for me. Yet, at first glance, the three story cream apartment block looks like any other in its central Jerusalem neighborhood – apart from its ramp and lift. The Apartments complex has long been renowned for enabling adults with severe physical disabilities to live independently within the community. Unique in Israel, the project allows people in wheelchairs to reside privately in their own apartment, with a second bedroom available for a caregiver should they so choose. A large communal room and wheelchair-accessible garden provide opportunities to socialize, while a specially equipped van and driver are on hand to take residents to and from work, shopping or to appointments. On a recent Tzedakah Adventure Tour led by philanthropy consultant Arnie Draiman, my family was privileged to meet with Shalheveth founder, Miriam Freier – one of Danny Siegel’s Mitzvah Heroes – and to tour the complex with director David Eliav, being introduced to several residents and visiting their homes. So popular have the apartments become – the waiting list is now very long – that additional funding is being sought for another facility. Before its transformation, Miriam told us, the building at 36 Shimoni Street, in the “Rassco neighborhood” had been a dilapidated apartment block owned by the Jewish Agency, the only such building in the area. Rassco – built by, and named after, the public Rural and Suburban Settlement Company – and the Jewish Agency rang a bell for me. Hadn’t my late mother stayed in the Jewish Agency-owned Anglo-Saxon Hostel in Rassco when she first arrived in Jerusalem in 1955? I only knew this because it is detailed in her diary, a non-descript navy-bound volume, which my sister and I had found stashed away in a drawer while sorting through our mother Naomi’s belongings after her death in 2013 following a long battle with Alzheimer’s disease. Indeed, so precious has the diary become that I have since embarked on a journey of discovery, exploring Israel of the 1950s in order to recreate stories from my mother’s vivid experiences recounted on its now yellowed pages filled with her distinctive script. While her handwriting may be familiar to me, the young passionate woman revealed by her words is a stranger with whom I am still becoming acquainted. While in Israel to celebrate our youngest son Jonathan’s bar mitzvah, I had planned to visit several of the sites mentioned in my mother’s diary. I managed to tour the upmarket cultural, leisure and shopping center of Sarona in Tel Aviv, originally a German Templer agricultural colony, which by Naomi’s day, had become Hakirya, the central government and military compound where she would frequent the library. I also surveyed the bronze, haloed Madonna on the roof of Jerusalem’s Terra Sancta College and explored the renovated First Railway Station, now a cultural and entertainment center: my mother would usually travel by train between Tel Aviv and Jerusalem where she attended classes at the Hebrew University, then located in the ornate, neo-classical surrounds of the Franciscan-owned College in leafy, affluent Rehavia. The Anglo-Saxon Hostel, however, was not on my list. I already knew from my research that it had provided tastefully furnished accommodation for professional immigrants, offering breathtaking views of the Jerusalem Hills, a communal dining room and maid service. I had even seen a photo of it from the 1950s when it was brand new, standing alone on a recently constructed and completely deserted street without a tree or blade of grass in sight. Surely the hostel was long gone, I had assumed, surveying the now crowded, built-up neighborhood. But that was before I discovered Shalheveth. Trembling with excitement, I stood on the entrance steps leading down to the street up which my mother had once hauled her heavy suitcase alone, abandoned by the taxi driver, who had blatantly overcharged her for the then two-hour trip from my grandmother’s home in south Tel Aviv. I took photographs of the stairwell, down which she would have tiptoed, after a night spent illegally at the hostel on an uncomfortable mattress without sheets after she had officially moved out, only deciding to return briefly when her possessions had not arrived at her new student abode. We spent the rest of that inspiring day, the eve of Jonathan’s bar mitzvah, meeting some of Arnie’s (and Danny’s) other Mitzvah heroes, including Judy Singer of Matnat Chaim, Israel’s foremost kidney donation organization, who had donated her own kidney to a complete stranger in 2013. Since 2009, around 280 such low-risk, live transplants have taken place in Israel, where hundreds of people remain on the waiting list, kept alive by dialysis, which severely impacts their quality of life. Every year some die while waiting their turn, hence the urgency of Matnat Chaim’s work in combating the severe kidney shortage by encouraging more voluntary donations. Judy’s altruistic attitude certainly left a lasting impression on us. We also visited Alice Jonah, who has helped established a supportive and dignified community for elderly Russian immigrants residing at the Diplomat Hotel, the five-star resort-turned absorption center. Some of the residents, including a pianist and a former opera singer, put on a concert in our honor, and I will never forget the charming and joyful 89-year-old lady, so elegant in her full black skirt, bounding up to us in between song-and-dance numbers, beaming from ear to ear, to tell us in stilted Hebrew about her seven great-grandchildren. We met Moran Shelly of Shachen Tov (Good Neighbor Association), founded and run by student volunteers, who distribute thousands of food baskets to needy families across Israel, as well as organizing clubs for youth at risk, tutoring centers, and mobile coffee shops for the isolated. The day ended with a visit to a woodworking and art workshop at Shutaf, which provides informal education programs for young people with special needs. Started in 2007 by dynamic mothers Miriam Avraham and Beth Steinberg, who could not find an appropriate program for their own children and so decided to create their own, the organization offers inclusive after-school activities and holiday camps where young people with disabilities have the opportunity to socialize with their more able-bodied peers. Over the past five years, Arnie Draiman has led our family on three Tzedakah Adventure Tours, each coinciding with the bar mitzvah of one of our sons. We have distributed toys to sick children at Shaarei Tzedek Hospital, visited the border patrol unit in the Old City of Jerusalem that supports soldiers’ families in need, met with Ruth Schlossman, who having narrowly escaped a terrorist attack herself, decided to establish Gift of Comfort, providing massage and alternate healing therapies to survivors of terror. We have talked to toyshop proprietor Aryeh, who on his own initiative helps individuals in need, and with Robbie Sassoon, director of the Crossroads Center, where more than a thousand at-risk, English-speaking teens come for help each year. In so doing, we have strived to teach our sons what becoming a Bar Mitzvah is all about, enabling them to learn from the example of Israelis working to make the world a better place. To be able to combine this with my own journey of discovery involving my mother’s past, has been a true privilege. 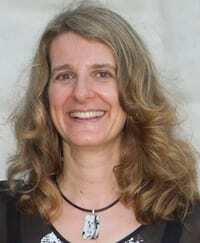 Shira Sebban is a writer and editor based in Sydney, Australia, who also serves as vice-president of Emanuel School, a pluralistic and egalitarian Jewish Day School. You can read more of her work on her blog. I recently surprised myself by turning down a rare opportunity to attain what I had long considered to be my dream job. Having compromised my career for motherhood for many years, I had often compared myself to those I consider high achievers, judging myself as coming up short. Yet here I was saying no. For weeks I had toyed with the proposal, feeling flattered. At last, I felt needed by someone other than family and community. I could contribute to society at large. After all, my children were older now and surely able to cope. Doubts lingered, however. The job would be all consuming. Was this really what I wanted? Then the realisation hit me. I rather liked my life. True, I had to juggle work and family and never got the balance quite right. But I suddenly saw how much I cherish the time I have to write and the precious hours I spend with my children, who are growing up so fast, not to mention the importance I place on my voluntary work. I was not prepared to sacrifice any of them for another job, which I now recognised was no longer even my dream vocation. That realisation has been a major step in my finding happiness. Not necessarily the emotional state of happiness, which Hugh Mackay in his 2013 book, The Good Life, dismisses as “the most elusive and unpredictable of emotions,” but rather happiness in its original sense, meaning to flourish. While Mackay doesn’t like using the word “happiness,” lest it be confused with its modern, more selfish meaning of how you may feel at a particular moment, I don’t see any problem in striving to discover “the happy life,” becoming fully and meaningfully engaged in whatever is on offer. Like many of us, I have often thought that what really matters is what makes us happy. We’re all going to die some day and few will long be remembered. So why not make the most of life? Indeed, didn’t the Americans think so highly of the pursuit of happiness that they enshrined it as an inalienable right in the Declaration of Independence? Rather than seeking external factors such as pleasure, wealth, or honour, Mackay argues that we should aim to live “the good life,” by which he means being motivated largely by compassion, treating others according to the Golden Rule of how we would like to be treated ourselves. In contrast, observant Jews seem able to find an opportunity for growth and meaning in every good deed they do and each bit of wisdom they acquire, apparently experiencing true happiness along the way. No wonder the 2011 Gallop survey found that religious Jews are amongst the happiest in the US! Those ultra-Orthodox Jews who identify as Chassidim go further still, promoting spirituality and joy through Jewish mysticism. As Rabbi Shloma Majeski explains: “Their radiant life and energy stems from their profound spiritual awareness and absolute clarity of direction. These are people who live for a purpose and derive vitality from it” (The Chassidic Approach to Joy). In other words, doing good can make you happy and when you’re happy, you do more good. So happiness is actually a moral obligation. Indeed, Rabbi Zelig Pliskin, who calls himself a “student of joy,” has an answer for the mother of young children, who is unable to pursue her career as planned. In his book, aptly titled Gateway to Happiness, he maintains that caring for family is an “act of kindness” of the highest order since it usually goes unappreciated. By making the effort to remind herself how meaningful her God-commanded work really is, the mother will overcome her frustration and find true happiness. Oh to have that level of faith! My children are also taught gratitude. As the Talmud says, “Who is rich? The one who appreciates what he has” (Ethics of the Fathers 4:1). Developing positive relationships is another area of focus. After all, we are social creatures who need connection through family, friendship and community. Surely such “social happiness”is crucial to a society’s survival. In fact, the principle to “love your neighbour as you love yourself” (Leviticus 19:18) has been called the most important in all of Judaism and the earliest form of the Golden Rule. I certainly intend to continue focusing on relationships, finding meaning and purpose through work and community, and hopefully savouring many emotionally happy moments along the way. Saba (Hebrew for grandfather) was my mentor and anchor, who encouraged me to strive for excellence and showed me that I could do anything to which I set my mind. He taught me to be humble, ethical and empathic and encouraged me to stand up for what I believe in and not be afraid to admit I had made a mistake, learn from it and move on. After all, that was the way he always behaved. Saba underwent many transformations in his long life, from Jewish scholar to Zionist rebel, laundryman, world traveler, benefactor, thinker, writer and friend to many. He lived throughout as if he was on an insatiable intellectual quest. As he wrote to me, “life is full of exciting curiosities, joy and deep feeling for the world’s mysteries”. Saba was the second son born to an Ultra-Orthodox family of textile manufacturers and fur merchants in the central Polish town of Zdunska Wola near Lodz. He was named Berl Dov Gross – one of about 50 Berls in the Gross family! His birth date was given as 16 December 1906, although a question mark always remained over that date, the family joking that he had changed it to make himself slightly younger than his future wife Chana. His mother died while giving birth to him, and his father then married her younger sister, who sadly would not prove to be a good stepmother to Saba and his older brother. This second union would produce three more sons and a daughter, all of whom were to perish in the Holocaust. Indeed, Saba’s father would be the last Jew to have a full religious burial in Zdunska Wola. Years later, a study of local Jewish cemetery records would reveal that Saba’s mother had actually died in 1905, proving the family’s suspicions to be correct all along. He had had good reason to make himself younger than he really was, helping him to escape Polish military service and immigrate to the then British Mandate of Palestine in 1925 – one of only a few members of his extended family to escape the subsequent reign of Nazi terror. For many years, Saba would beg his family to flee, but no one would listen. Tragically, when they later turned to him to help them escape, he was no longer in a financial position to do so. It was a heavy legacy, which he bore stoically but did not allow to hamper his zest for life and all it had to offer. The family belonged to the Gerrer Hasidic movement, then probably the largest and most important Hasidic group in Poland. While Hasidism generally promotes spirituality and joy through Jewish mysticism, the Gerrer Hasidim emphasize religious study and the objective service of God. Forbidden to learn anything but sacred texts as a child, Saba nevertheless managed to sneak secular books under his bedclothes, learn violin, and even find a tutor to teach him mathematics and other worldly subjects. Although he rebelled against his religious upbringing, it would stand him in good stead in later life, enabling him to cite Jewish textual sources with ease. He would often recall being taken as a young boy to another town to meet the Rebbe or leader of the Gerrer Hasidim, describing a crowded room where he and other boys literally hung from the rafters to see what was happening. As an adolescent, Saba became a member of a local Zionist movement and announced his desire to join the pioneers in Palestine. His father would only agree on condition he enter into an arranged marriage. His bride Chana was from the nearby city of Lodz, and the young couple was married in 1924 and left the following year for Tel Aviv. Chana’s parents and sister also decided to follow their lead and move to Palestine, only to make the fateful decision to return to Poland when their money ran out soon afterwards. Arriving in Tel Aviv without a trade, Saba learned about textiles and proceeded to combine study, both secular and religious, with work. He and Chana would come to have two children, Naomi (my mother) and Moshe. A generous man, Saba was happy to share the little he had with those less fortunate. His strong individualist moral convictions and sense of justice, however, also placed him on a collision course with the powerful Histradrut or Labor Union, finally resulting in him returning his membership card. He set up his own laundry business in Jaffa, but it was destroyed by fire during the Arab riots of the late 1930s, which were protesting against Jewish immigration and land transfers. Thus, the family was left without a source of income, but as Saba would later reflect in a letter to a friend, he would come “through the hardest years of 1929-39 unscathed, not having bowed at any time to any person”. According to family legend, Saba had no option but to go down to the harbor, where he found one ship departing for South America and another for Australia. It was July 1938, and fortunately, he chose the vessel heading for Melbourne, promising his young family that he would send for them as soon as he could. War, however, was to intervene, and it would be several years before he could afford to purchase even one ticket for a family member to join him. Meanwhile, back in Tel Aviv, Chana was forced to resort to housecleaning to feed her children. Having arrived in Melbourne without a word of English, Saba worked hard whenever he was able. When unemployed, he spent his time reading in the public library and listening to records in a local music store. He would then, at times, feel obliged to spend his meager income on classical music records instead of food. After the War, Saba was finally able to bring his family out to Australia, starting with his teenage daughter Naomi. By then, he had begun to travel overseas, and over the years, he would visit exotic places before it became fashionable to do so, such as Ceylon (Sri Lanka), the Pacific Islands and even Dutch Guiana (Suriname) by freighter, maintaining a travel schedule that would exhaust someone half his age. He reveled in the adventure of being an independent traveler of modest means, although as he grew older, the advent of mass tourism with its package tours and controls disillusioned him considerably. In 1946, he spent the entire year in China, shortly before Mao Zedong came to power, only returning to Australia when his family and friends lied to him that his factory had burned down. While in Shanghai, he assisted European Jewish refugees with their emigration to Australia. In Melbourne too, he would help newcomers from Poland and Israel to become established. He and Naomi enjoyed a warm relationship and were well matched intellectually, spending long hours in discussion. Saba was a handsome man, and many, upon seeing her on his arm, found it hard to believe they were father and daughter. Eventually, his son Moshe joined Saba in the laundry, and by the late 1950s, had taken over management of the business. Chana by then was living in Melbourne too. Although separated from Saba since 1938, they never officially divorced. He had a home built for her in Tel Aviv and continued to support her in Australia. For the rest of her life, Chana would live with Moshe and his wife Yona, helping to raise their growing family. Now free to focus on his intellectual pursuits, Saba moved to London for a while, where he eventually set up house with a Hungarian-Australian artist. The relationship would last for some years during which they traveled widely, but by the late 1960s, it was over, although they remained friends. Fascinated by the ancient world, Saba spent about thirty years studying Israelite society and in particular, Abraham and Moses. The result was his book, Before Democracy, in which he attributed the Israelites’ survival to their tribal way of life based on family and individual responsibility. He controversially argued that their transition to a centralized monarchy was an ill-conceived and retrograde step “but a stone’s throw away from despotism”. Reluctant at first to have his life’s work published, Saba preferred, as he wrote to a friend, to “preserve my integrity and end my life as an individual who refrained from partaking in the rat race of publish or perish”. He ended up, however, battling unsuccessfully to have the book published for several years. Finally offered a contract, he withdrew his work before it had seen the light of day, refusing to make the major changes the publisher required. In the end, he never found the “daring publisher” he hoped for, and the family ended up self-publishing the book, although sadly, by the time it appeared, he was too ill to appreciate it fully. Saba endured several bouts of ill health, which on occasion left him scarred, but not beaten. He was like a cat with nine lives, rebounding from each episode with renewed vigor. Eventually, however, he was diagnosed with Alzheimer’s disease – the same illness, which tragically, would later come to afflict Naomi too. “I am losing my ‘I’,” he told his daughter, by which he meant he was losing what made him whom he was as a person. My last memory of my brilliant Saba is of him sitting in the middle of his room, endlessly twisting a rubix cube around in his hands. He passed away on 8 July 1994. To this day, I still regret that I did not learn more from him about my Jewish heritage while I had the chance. Almost ten years earlier, he had given me a pair of silver candlesticks from Israel as a wedding gift, fondly expressing the hope that I would remember him each time I lit the Sabbath candles. Every Friday evening and on numerous other occasions, I remember him as my beloved Saba, my teacher and my friend, from whom I learned to question, to reason and to explore. In my mind’s eye, he remains the invincible hero of my youth, strong and independent, hoisting his bag onto his shoulder and striding away, as he did when we bid each other farewell at the airport for the last time. Shira Sebban Blog at WordPress.com.